My pastor’s “Daily Word” is an email devotional that he publishes Monday through Friday each week. The message the day following my MRI reading and the scheduling of my shoulder & bicep surgery couldn’t have been more timely. The theme was on the treasure of trials in our life. Pastor said trials can fortify us, prove us, test us, and prepare us. While I had no idea how pastor’s statement would play out, it was my goal from the beginning to live by the directive of 2 Corinthians 1:3-4. If the only positive that would come from my surgery is my ability to help and encourage others in the future going through a similar trial, then so be it. Reflecting back now after 23 weeks of recovery, the following is how the trial of my surgery has produced treasures in my life exactly as Pastor promised. It’s easy to take the little things for granted until something changes massively that shifts your perspective. For the record, I am single, live alone, and I’m right-handed. After my surgery, the adjustment of losing 98% of the use of my right hand and arm was challenging. Dropping the sling after the first six weeks was a blessing although I still had very little strength in my right arm. The most I could lift was my phone & keys…seriously…without pain. Drinking my morning coffee remained a left-handed activity until about the 8th week post surgery. My boss was very supportive from the beginning. He encouraged me to get the surgery done and then do my best to get back in the field as soon as possible. He further gave me permission to hire labor as needed to assemble and deliver my demo products which is a big part of my job as a manufacturer rep. While I appreciated his offer, I never took advantage of it. My job allows me to office from home and for the first week after surgery I pretty much stayed in my office. Starting the second week, I was back in the field calling on clients. 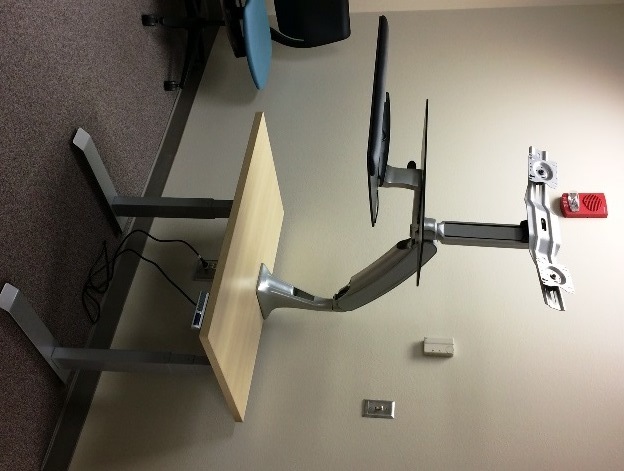 The one highlight was delivering one of my adjustable height demo tables to a client’s office in North Dallas…left-handed. This included loading and unloading the table from my SUV and delivering it to the 8th floor of an office building. 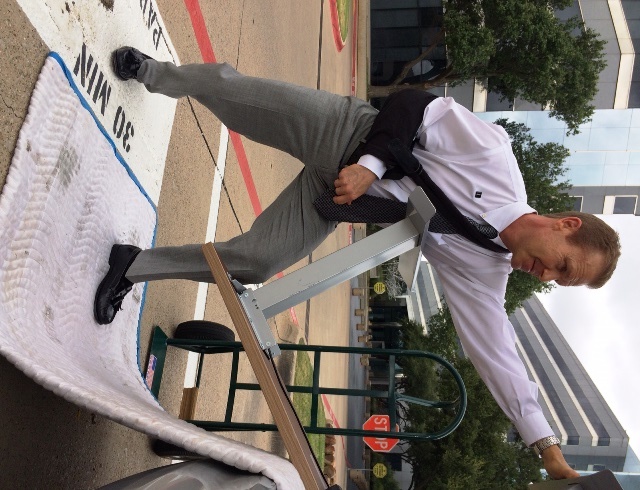 Delivering a demo table to Supreme Lending in Plano, TX two weeks post surgery. The following week included two group presentations and the installation of our new Solace at one of my client’s offices….again…left-handed. As my work schedule continued forward, I never let my right arm being in a sling stop me. It may have slowed me down…but it never stopped me. Treasure gained…finding a way despite the obstacles. While I claimed 2 Corinthians 1:3-4 from the beginning, there were days were I struggled with my attitude. The gym environment was hard in particular because it exposed the limitation I faced of not having the use of my right arm. While I was able to learn to do basically everything needed in the rest of my life left-handed, there’s no substitute in the gym. You’re either training with your right arm or you’re not. For someone who is as passionate about training as I am, this was hard to deal with. One morning in particular, I had finished my work with weights and was getting in a little cardio on a treadmill. I always read either from a book or my tablet while doing cardio. 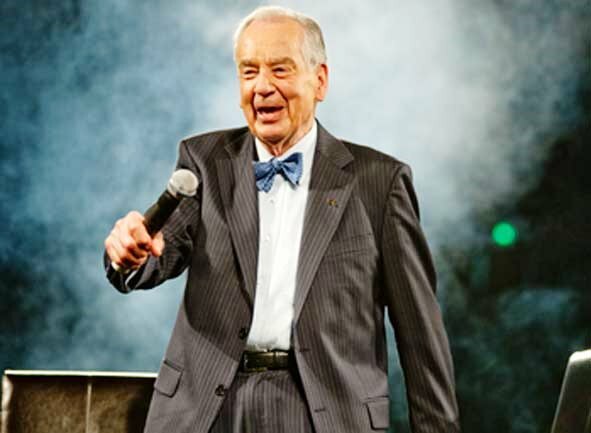 That morning I received a message from Tom Ziglar regarding a story about his Dad. It was just the shot I needed to shake me up and move me forward rather than staying stuck in the emotional low that I was feeling. When Zig was in the twilight of his career, he suffered an accident that caused him to lose some of his short-term memory. For a professional speaker this is a challenge. Zig had spoken to thousands upon thousands over the decades, and now he was faced with an injury that could have ended his career. Zig however would not be stopped still having the desire to share his life changing messages. Zig Ziglar at his BEST! So with the help of his daughter Julie, Zig adopted a new style of speaking. He and Julie would partner on stage in an interview like format where she asked questions and Zig would answer. This new approach helped him overcome the challenge of the loss of memory as her questions were strategically planned to tap into his vast wisdom. 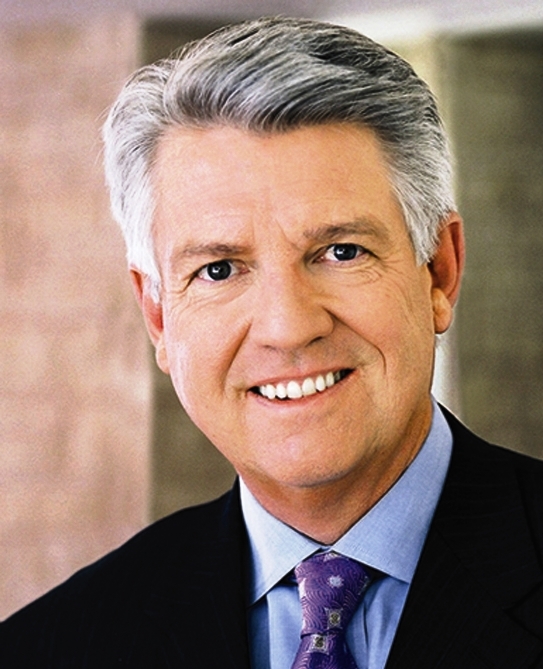 This interview format allowed Zig to continue speaking for a period of time sharing his messages of hope and encouragement. When I finished reading Tom’s story about his Dad, I literally had tears running down my face. Here I was whining and feeling sorry for myself about the temporary set back of my shoulder surgery while Zig was so committed to following his passion for helping others, that he overcame the challenge of memory loss. I felt humbled, ashamed, and all the more resolved to move forward and find a way to be a blessing to others through my personal trial. Treasure gained…persistence in the fire. While a struggle in the beginning, I learned to make a mental shift in the gym and let go of the idea that I was only training 75% of my body. My right arm may have been in a sling, however the rest of my body still worked just fine, and I trained with same intensity both emotionally and systemically as before my surgery. PT at Clair Physical Therapy on the other hand was a different story. For the first six weeks I went three days a week for about 30 minutes. My treatment was all passive in that Jacqueline, my therapist, moved my arm in different ways working to restore my range of motion. Of all the things I’ve done in the gym over the years that were less than pleasant, she hurt me more than anything I’ve ever experienced. After two weeks, my doctor gave me permission to add a pulley system and do extra work at home. From the first day I purchased the pulley to the end of the twelfth week were I started strength training, I probably did thousands of reps. The exercises done with the pulley were a life saver and I really attribute a lot of my speedy healing & recovery to that device. 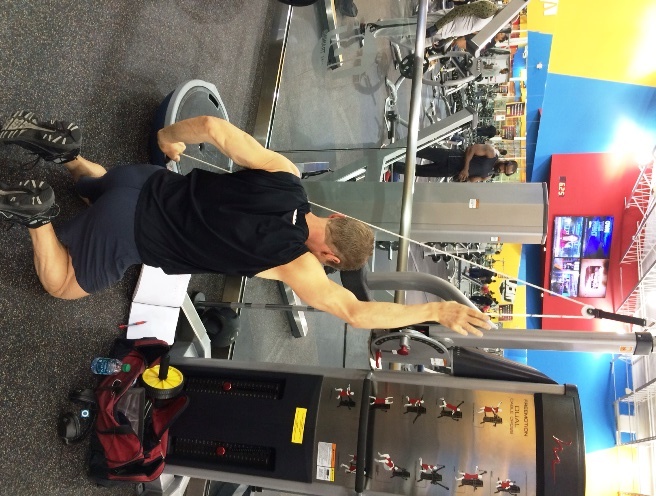 Restoring range of motion with the “magic” pulley….for 1,000’s of reps.
As much as I wanted to lift again, it was painfully obvious that I had a lot of healing to do. In the beginning I couldn’t raise my hand out to the side from my thigh more than a few inches without experiencing extreme pain in my shoulder. Further, when Jacqueline would stretch my arm back up and over my head, my reattached bicep tendon felt like it was coming undone. 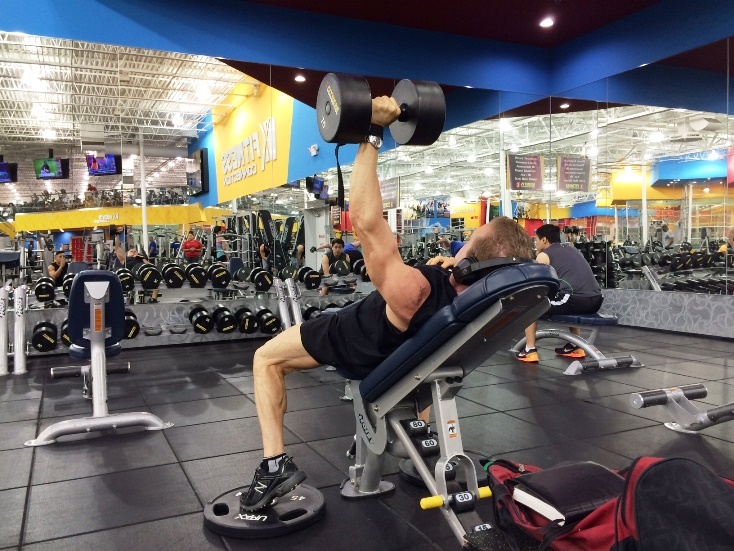 For someone who’s been lifting now for over 30 years where I’m used to measuring progress in pounds and reps, it was quite the shift to equate progress to inches gained in terms of range of motion. Besides the pain of PT, I had to resolve myself to the fact that it would take a good year to fully regain my strength. For someone who is so DRIVEN…this forced rest has been hard to take. The progress came faster in the second six weeks as the healing continued and my range of motion improved. I still went to see Jacqueline two days a week and did an extra hour of work from home daily on progressively more challenging exercises all geared at range of motion. After twelve weeks my doctor gave me the green light to start strength training and after fifteen weeks, he released me from PT completely. The progression has been slow and as of writing this post, I’m somewhere between 75% and 90% of my normal strength depending on the movement. The road has been long and yet I’m very encouraged to be lifting again after my extended break from normal training. My only limitations now are in the gym and my strength is coming back slowly week to week. Every other area of my life is totally normal which is a blessing. Oddly enough the things I was concerned about in the beginning turned out to be non-issues. I found a way to do everything as needed left-handed…just a bit slower. The one thing I didn’t consider was the extra time needed to do everything immediately following my surgery. Cooking, shaving, taking a shower, dressing, and virtually every other daily activity took longer when limited to just my left hand. I gained massive perspective over the value of having both hands and arms to do the normal daily task that make up life. To go from normal to not being able to wash your face with both hands or comb your hair because you literally can’t lift your right hand to do the work, will give you a change in perspective. Then again, I have to look at my trial in the proper perspective. My trial has been nothing more than a temporary and painful inconvenience where I should fully recover. When I see people who have lost the use of their legs and arms due to an accident or disease, it is humbling and convicting to me. Further, the story about Zig above just drives me all the more to have a servant’s heart and to use the gifts I’ve been given to help others less fortunate. Treasure gained…the value of perspective. When Dr. Burns told me that I needed surgery, I asked how long to recover. His answer was six weeks in a sling and at least twelve weeks of physical therapy. He also said it would take a good year to fully recover my strength. I then asked whether I would be able to train hard again. He said you can still train hard however you need to consider your age and start training for longevity versus trying to be “He-Man”. Given my passion for lifting and the years I’ve devoted to training, these were not the answers I was seeking. Fortunately I had the story of what my pastor, Dr. Jack Graham, had gone through as a source of hope, encouragement, and perspective. A few years ago Dr. Graham faced a life threatening health challenge that took a bit of time to recover from. During his recovery, he shared that he often asked God to just give him his old life back. God’s ultimate answer was “No, I’m not going to give your old life back…I’m going to give you a better life.” And true to His promise, pastor will say today that he’s in a better place in every respect than before his health challenge first reared its ugly head. This entry was posted in Christian, Faith, Follower of Christ, life path, recovery from injury, rotator cuff injury, shoulder injury, torn bicep tendon, Uncategorized and tagged Christian, Faith, Follower of Christ, life path, success. Bookmark the permalink.